While a student at the University of Toronto, Laura approached an early mentor, Carol Franklin, founder of the innovative Andropogon Associates, and asked, “How do you even start?” The answer, which has helped her over the years: “Don’t look for the big things. Look for the one or two little things that can make a difference. They may be small. Start there and build on that. And out of the little things, will come the big things.” Laura’s talk focuses on the little things – the building blocks – and how we can build them into something big. To build resilient landscapes, we need genetically diverse plants. We can learn the value of genetic diversity from the cheetah. Researchers have found that all cheetahs are effectively genetic twins – most likely due to two population “bottlenecks” – when populations dropped to a small number of individuals and then built back up. The reduced genetic diversity limited the cheetah’s ability as a species to adapt and weather disease or other stresses. What lesson can we take from the cheetah and apply toward preserving our native plant species? If we propagate, sell, or specify in designs species that are vegetatively propagated – (all genetic clones of the original plant) – we are making our landscapes more vulnerable. To ensure some level of genetic diversity, we can start by seeking out seed grown plants. When possible, find local ecotypes grown from seed because they are best adapted to the climate and conditions found nearby. If we choose to work with a cultivar, doing so responsibly requires getting information about its origin and how it is produced. While some cultivars are based on a natural variation or subpopulation, many are created by growers breeding plants and selecting for particular traits. Questions to consider include: Does the cultivar offer any genetic variation? Cultivars produced vegetatively generally do not. Where did the cultivar originate? A cultivar selection based on plants from the southern U.S. may not adapt well to the northern U.S., for instance. How much does it differ from the wild population? This may affect how it performs in the landscape and interacts with other species, including pollinators. As Laura points out, cultivars may be bred for traits that are not universally desirable. For instance, she has observed that Penstemon digitalis ‘Husker Red’ grows fuller than the straight species; designers looking for plants that play well when nestled into a matrix may find this cultivar to be a poor fit due to its excessive fullness. While many plant catalogs describe what a plant looks like – flower color, height, and shape – there are often information gaps about how the plants were propagated and how they perform in response to landscape conditions like dryness, shade, and pH. 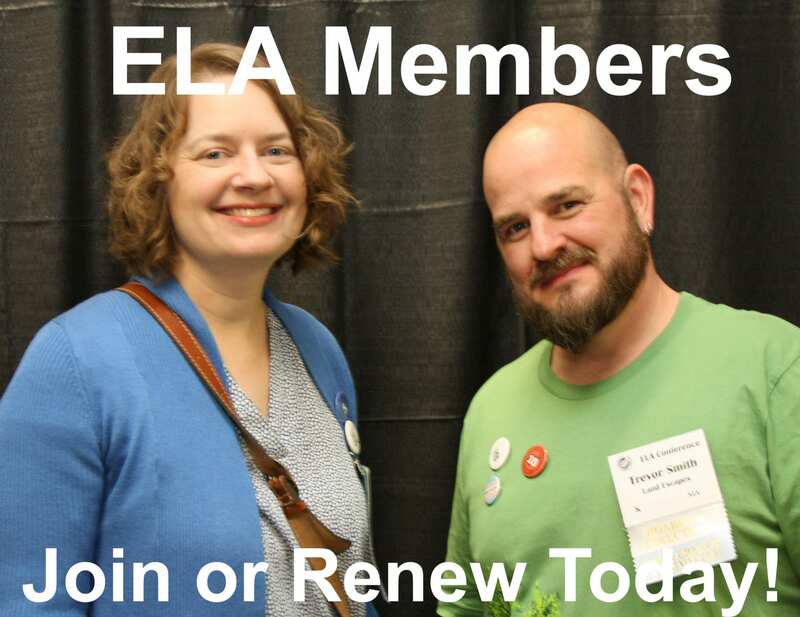 Laura highlights the need for nurseries – and those introducing new plants to the trade – to provide more substantive information about their offerings and the differences between them. Species diversity is not just a matter of putting more species on a plant design list. If all designers plant the same 50 species, they are not achieving diversity. Referencing a paper by Reed F. Noss related to bird populations and diversity at different scales, Laura highlights the need to look at edge habitats because greater species diversity exists where different habitats meet. Taking a broader view, diversity comes from having multiple types of habitat – not just edges. Applying that understanding to design, practitioners can achieve greater diversity by including species that are adapted to unusual habitats, not just the easy and adaptable species. With the aim of understanding the value of different habitats, botanists have developed tools for ranking habitat quality. These tools include the Universal Floristic Quality Index and the Plant Stewardship Index. Lower ranking species, known as generalists, grow in a wide variety of habitats. For instance Panicum is a generalist, readily growing in dry or wet conditions. When a habitat contains many generalist species, it is considered lower quality habitat and is likely a disturbed area. 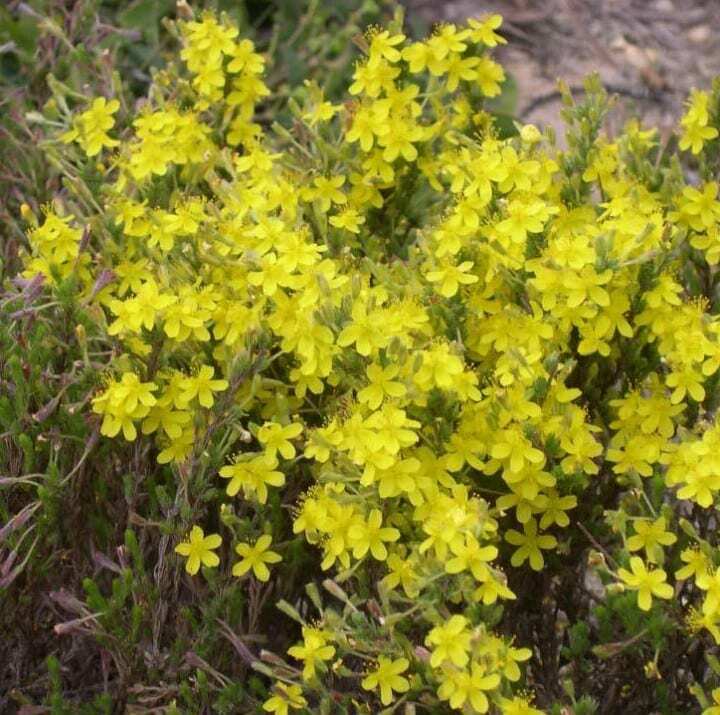 Species that are not as adaptable and are more faithful to a particular habitat – such as beach heather (Hudsonia), a low shrub of sand dunes and coastal areas – are known as conservative species and are ranked higher. An area containing many conservative species is deemed higher quality habitat. If designers stick with generalist plants – the easy and foolproof species – they are not building diversity. Though more risky, we need to look for opportunities to use species that are more specifically adapted to particular site conditions. It may require experimentation along with horticultural knowledge, for instance, to try using a conservative plant like beach heather in a sand-based soil around a rain garden. However, Laura recommends experimenting with less than 10 percent of an unfamiliar species. By allowing plants to reproduce, we can also build resilience into landscapes, encouraging plants to naturally provide for the next generation. Rather than working to suppress the seed bank due to weed concerns, we need to engage the seed bank by managing it. One way to do this is to observe what is coming up before mowing it down or weeding it out. 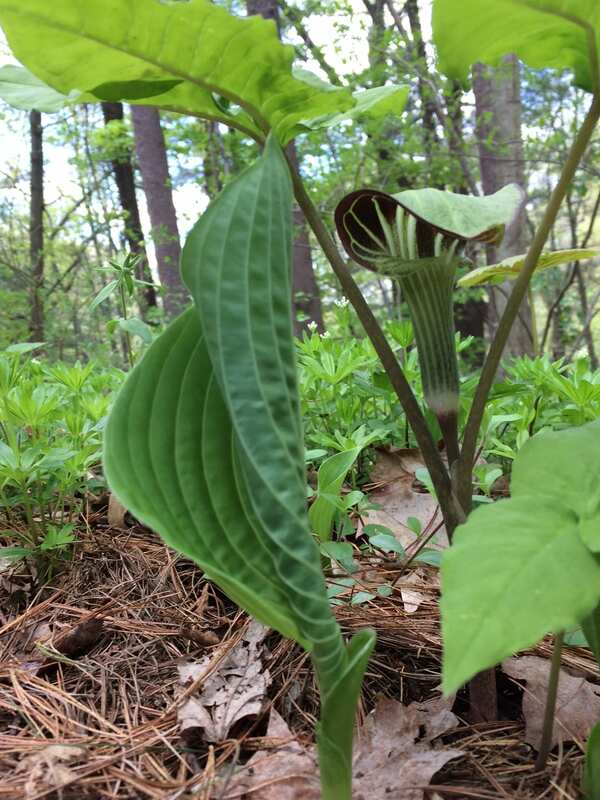 You may discover a volunteer oak seedling in a spot where you wanted to plant a tree, or a surprise woodland species like Jack-in-the-pulpit in a small suburban lot. When you play with timing and are more thoughtful, you can make discoveries that, if successful, you can apply again in the future. Desirable volunteer seedlings can come from a myriad of unexpected places, sometimes as hitchhikers on plants purchased from a reputable nursery. 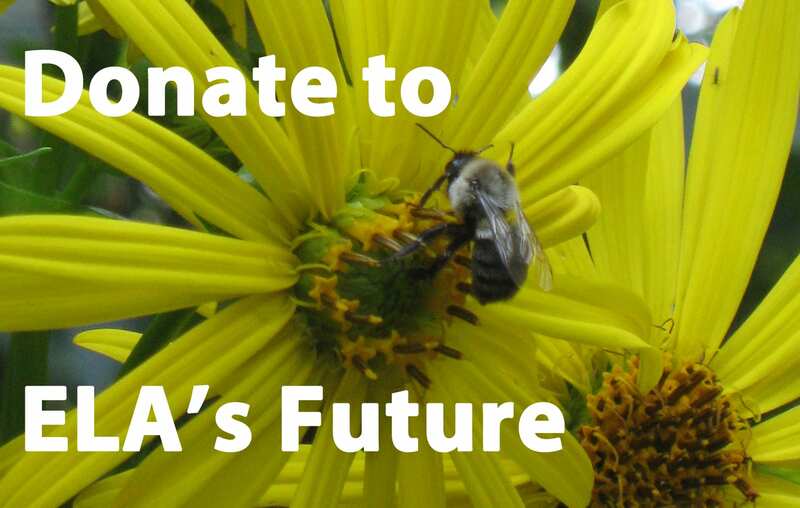 On a green roof project where there was open ground, Laura found volunteer seedlings of great blue lobelia, wild geranium, and common milkweed – all came in on the pots they purchased. Managing these bonus plants just required some limited editing and adjustments in irrigation. As Laura points out, what we’re trying to create are diverse plant communities based on functional relationships with proper structure AND they have to look beautiful. In many cases, the expectation is not for a natural landscape but for a cultural landscape. It’s not about the number of species used but how they knit together. Meadows provide a good case study with a diverse assembly of plants. Laura cites two examples in Pennsylvania, Houston Meadow and Pennypack Ecological Restoration Trust. In both meadows she finds vertical layers, where the understory can range from mosses to violets and Geum and poison ivy! 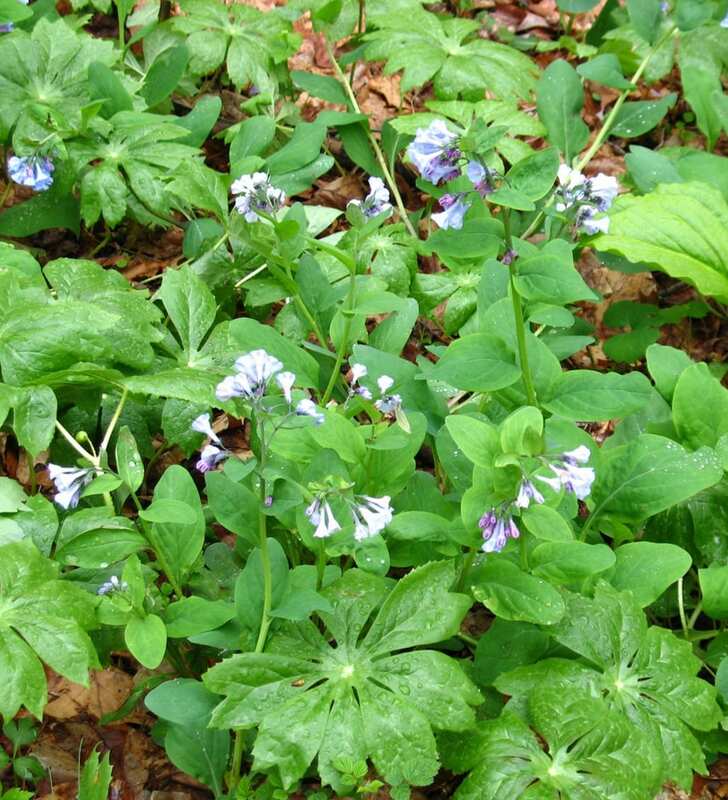 With good soil, there can be surprisingly wide diversity even in the understory. 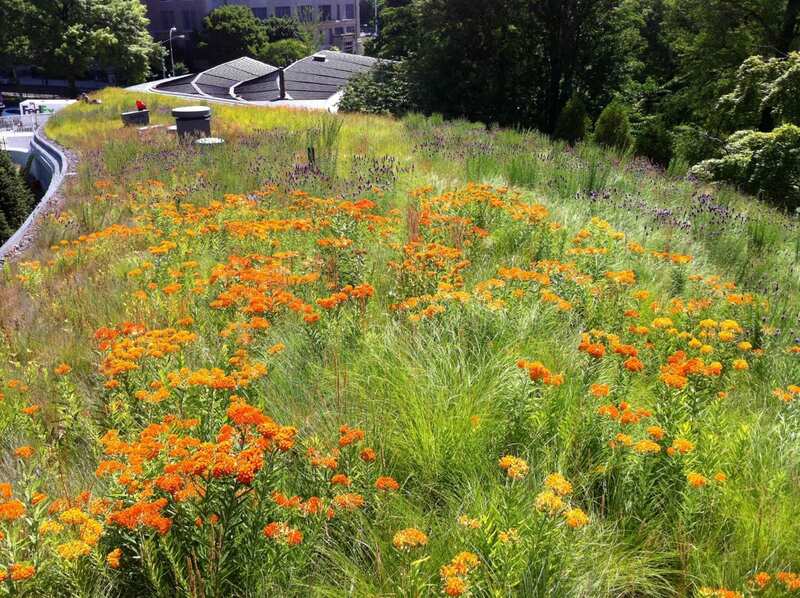 At a green roof in Tacoma, WA, she learned that the manager was overseeding the site, which resulted in interwoven species and prompted the question: How can we apply such restoration practices into our built landscapes? A desirable goal, considering that use of seed and reproduction can result in lower investment costs (fewer plants to purchase). 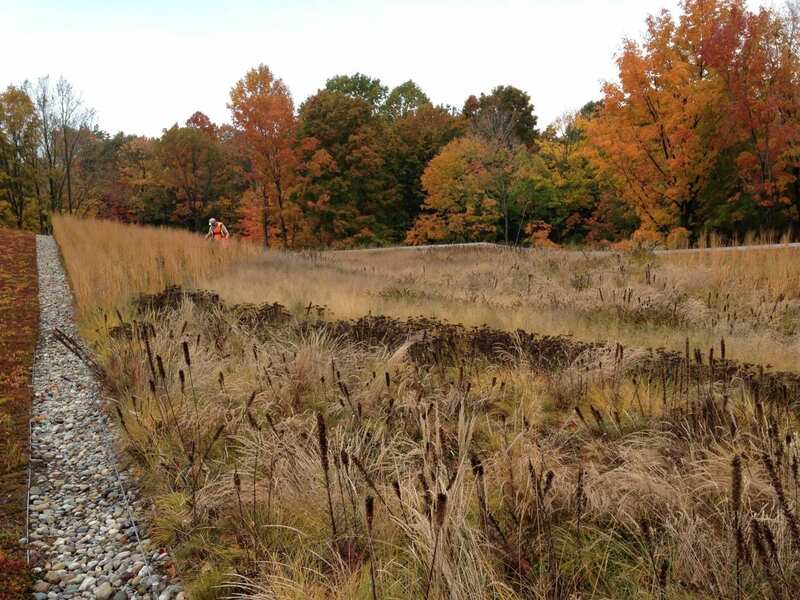 At the Singh Center for Nanotechnology in Philadelphia, Laura’s team overseeded a sedum mat green roof with native grasses and wildflowers such as little bluestem and nodding onion. After five years, these native plants started from seed are thriving. Had they been installed as plants, Laura posits there would have been high rates of loss. On the same roof, the team observed sedum as a nurse crop for native plants. One documented study shows that Echinacea grown in sedum, though shorter in stature, survived better during summer drought than the same plants under the same conditions growing without sedum. Researchers don’t yet know why the sedum helps – possibly by mediating soil temperatures, helping to retain moisture, jump-starting soil microbiology in engineered soil, or some combination. How might this translate from roof designs to the ground? We need to look for examples of native groundcovers to help fill that role in a functional planting design. To further illustrate the importance of ground cover, Laura spoke of a flooding problem at Haverford College in Pennsylvania. The grounds manager stopped mowing the lawn near the area subject to flooding, allowing it to develop into a meadow. The flooding stopped. Uncomfortable with the untidy look of the unmown area, the college administration insisted that the area be mowed. With the meadow cut down, the flooding resumed. This story illustrates not only the value of vegetation but also the importance of how people perceive it. 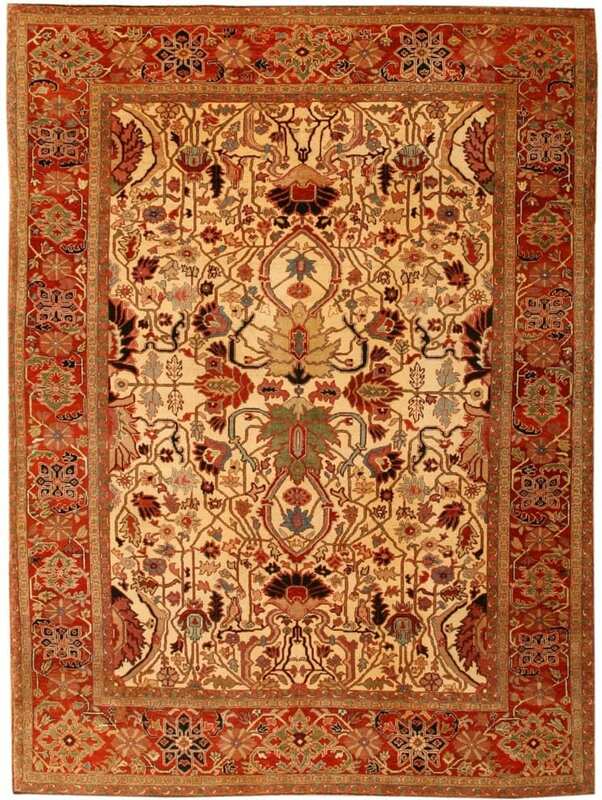 Patterns in Turkish carpets can provide inspiration. After designing her share of landscapes that clients perceived as messy and that required her to explain or modify the design, Laura found inspiration in Turkish carpet patterns. Though diverse in design, they have a border and internal order. This clarity of pattern can be applied to landscape designs. Rather than achieving patterns by designing wide swaths with a single species, she looks for combinations that add interest. 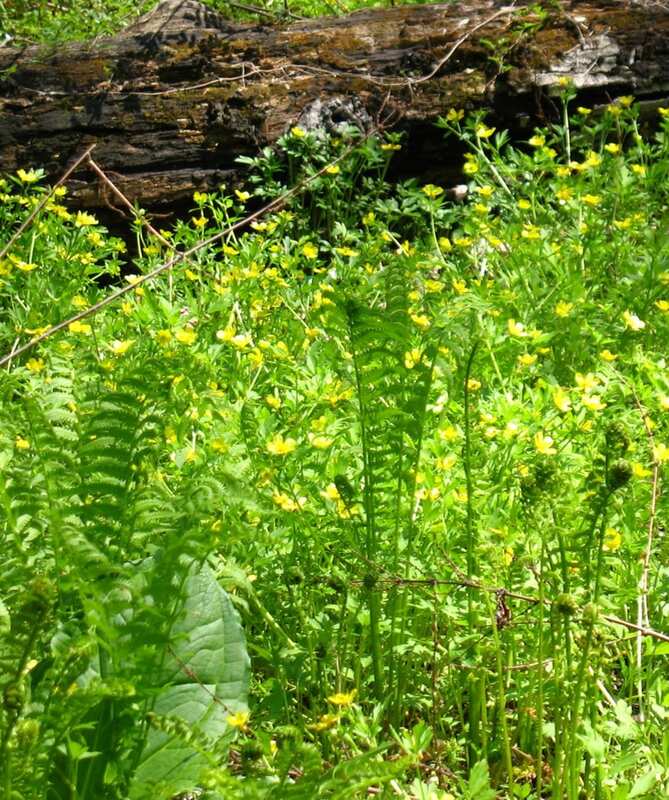 Examples include combinations found at Bowman Hill Wildflower Preserve in Pennsylvania, such as May-apple and Virginia bluebell, ironweed and little bluestem, ostrich fern and native wood poppy. Brooklyn Botanical Garden manages to achieve naturalness with an interwoven, tapestry-like appearance that endures through the seasons. Combinations there include Penstemon and butterfly weed with a variety of grasses, offering elegant changes in color and textures over time. Turning to another green roof example, Laura points to the importance of borders and creating contrast. 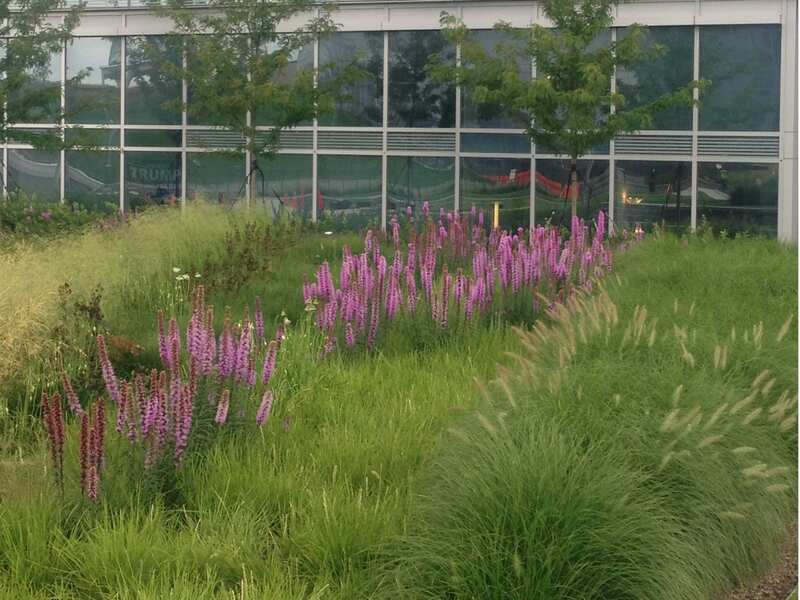 At Jackson National Life Insurance in Michigan, wide meadow-like bands were planted to create high visual contrast. They used swaths of grass species like Panicum, Sporobolus, and Eragrostis, tapered by height, and through the middle placed bands of wildflowers such as Liatris. Part of the management at this site is “chop and drop,” allowing the seed to regenerate onsite and fill in the gaps. To apply the familiar patterns of carpets to a more urban setting, Laura refers to the research findings of Joan Iverson Nassauer from the University of Michigan. Nassauer’s work focuses on people’s perceptions of landscapes and the need to include cues of human intention in order for most people to see and recognize the beauty in a designed ecosystem or landscape. Some of those cues include: clean edges and frames such as mown pathways around a meadow; artful focal points such as a birdhouse, garden sculpture, or even a large tree; built forms such as walls and other hardscape structures. Laura encourages us to consider when a pattern is functionally (ecologically) driven versus a cultural expression. To understand what is meant by functional patterns, consider the variations in a plant community in response to changes in light and moisture patterns under a tree. Whereas cultural pattern is about how we arrange plants to convey the character of landscape. Working in urban areas, we need to be very clear about the difference. Sometimes there are real functional patterns underlying what we are planting, and we must respect those functional patterns to enable the plant community to thrive. Sometimes the pattern is cultural and therefore malleable. For instance, does planting trees in a straight line invalidate a functional pattern? Designers often plant trees and shrubs in random patterns to communicate that theirs is a sustainable design. While this is appropriate in a natural setting, in an urban setting what harm is there in planting in straight lines, provided it does not impact the functioning of the plant assemblage? By doing this, the designer signals the intentionality of the design to the general public. By planting grasses and perennials in straight rows, it looks ordered to the corporate eye. Over time, the plantings will move and soften, and a balance will have to be struck between perception and stewardship. At a design project in Alden Park in Philadelphia, Laura’s team wove ribbons of new plantings through an existing planting in need of an upgrade, and they engaged the construction team to help with the installation. After showing loosely where the ribbons were to be installed and a layout example using Heuchera and Tiarella, they had the crew complete the layout and installation. Using that partnership, they were able to complete the project faster than if they had worked from detailed drawings. It also made the process more interesting for everyone and more adaptable at the site. For long term success, Laura points out the importance of communication and ongoing dialog between all the parties involved in a project, including those responsible for the grounds maintenance. If there is a gap in communication, you can end up with problems like holes where annuals were installed but not replaced the following season because the maintenance staff was unaware of the need. More information from nurseries about how plants are propagated – seed grown and naturally occurring varieties versus vegetatively propagated. 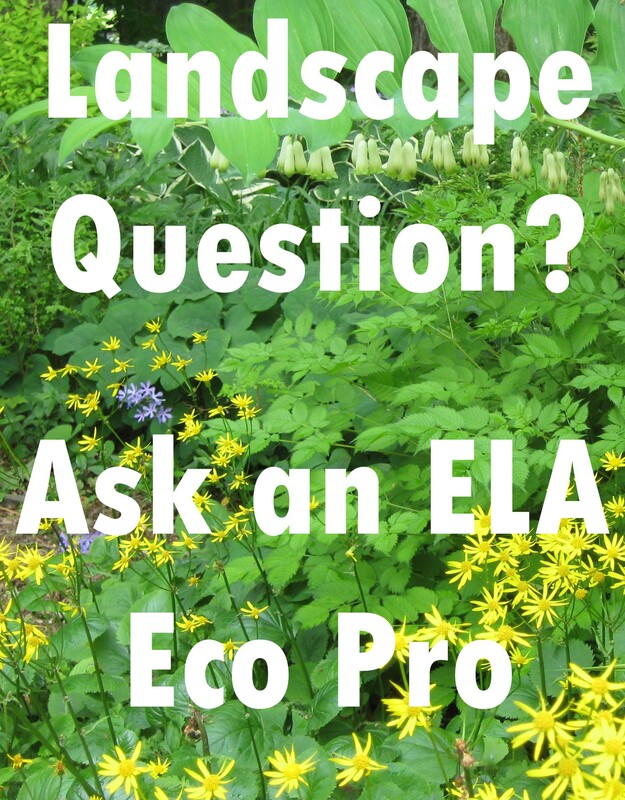 More information about how varieties and natural ecotypes perform – not just how they look. More fluid interactive working process among designers, horticulturists, ecologists and ground managers, and more iterative conversations. Cayte McDonough is Nursery Production Manager for New England Wild Flower Society’s Nasami Farm Native Plant Nursery in Whately, MA. 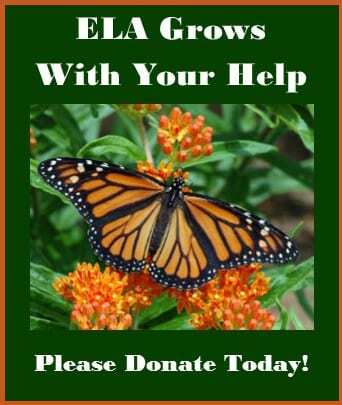 For the past 19 years she has worked to propagate, cultivate, understand, and promote New England native plants. Cayte and her team produce plugs of many species from seed of known wild origin. To ensure genetically diverse plants, staff and volunteers sustainably collect seed from thriving wild populations of common plant species across New England. Cayte can be reached at cmcdonough@newenglandwild.org.